In 2003, the choreographer Danièle Desnoyers was invited to create a work in residence at the Musée d’art contemporain de Montréal. The resulting Duos pour corps et instruments was performed at the time by three of Montreal’s most renowned dancers: Sophie Corriveau, AnneBruce Falconer and Siôned Watkins. Ten years later, to celebrate 25 years of creation within her company, Le Carré des Lombes, Danièle Desnoyers invited three exceptional performers—Karina Champoux, Clara Furey and Anne Thériault—to work with her on a [re]creation of this work, which had toured on three continents and had earned its creator widespread acclaim. Duos pour corps et instruments is based on the idea of encounters, notably that of the choreographer with sound designer Nancy Tobin, with whom she explored novel and playful ways of exploring the musicality of the body. 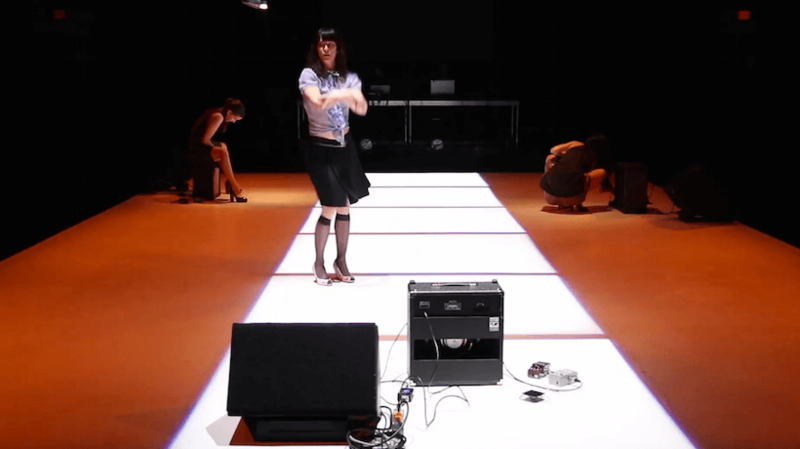 The result is an instinctive, visceral dialogue between movement and sound based on low-tech equipment, speakers that are occasionally carried by the dancers, and interference as an intense, raw and fascinating soundtrack. 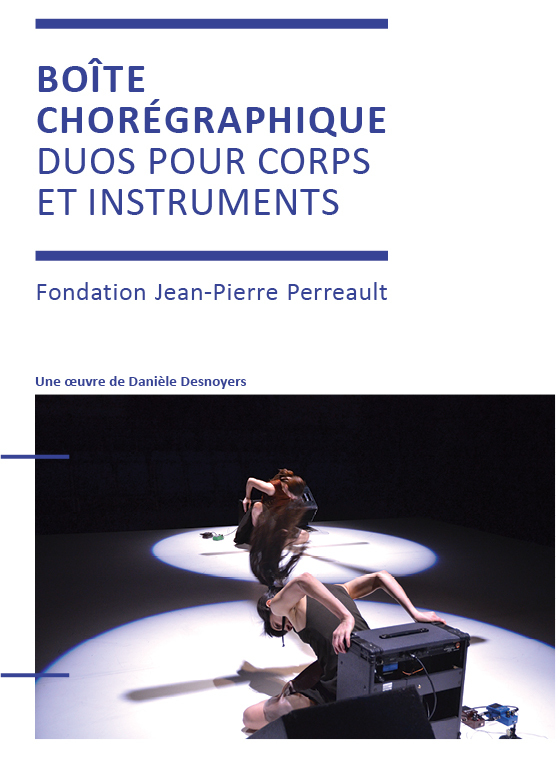 Duos pour corps et instruments is a beautiful, poetic work in which every part of the body seeks to erase the distance between dancer and spectator, between seeing and experiencing. A choreographic work and sound installation featuring an instinctive, visceral dialogue between movement and sound, Duos pour corps et instruments today bears the stamp of a new contemporaneity. Its three exceptional dancers, each of them preeminent figures in Quebec dance, are as charismatic and emblematic of the Desnoyers style as the original trio. The choreography—composed of light and sublime distortions, variations on a theme, situational interplay, crossings and uncrossings of legs—remains unchanged. The expenditure of the bodies reveals the raw energy, sensuality and boldness of a generation accustomed to performance art. The release of weight leads to a certain nonchalance, while the relationship to the ground and to sound is all the more spirited and physical. At once liberated, sensual and languid, the dancers’ entire bodies vibrate with the interferences produced by their interactions with the amplifiers as they brazenly perform in close proximity to the audience. In turn mischievous, rebellious and explosive, they weave their relationships of complicity and rivalry in a refined and unfettered dance that seeks to eliminate the distance between stage and audience, between seeing and experiencing. A pivotal work in the artistic path of the Montreal choreographer, the piece has lost none of its charm, power or relevance. Neither an acoustic nor a totally choreographic work, in turn a solo, duet and trio – and sometimes all of these, or more, at the same time – Duos pour corps et instruments is based on the notion of the encounter. First that of Desnoyers with certain dancers who have left their mark on her work: the superb Sophie Corriveau, AnneBruce Falconer and Siôned Watkins. Next, with sound designer Nancy Tobin, with whom she is pursuing her research on an acoustic material/mode that was first developed five years ago for Concerto grosso pour corps et surface métallique. And finally, in a slightly more instinctive and playful manner, between the body and its audio and videographic extensions: close-ups, out-of-focus shots, etc.